Flying on a Southwest Airlines flight in 2016 might be a bit more comfortable for some customers used to cramped spaces: The airline unveiled a new seating structure for its upcoming planes that gives consumers an extra half-inch of seat width. Bloomberg reports that Southwest’s newest seats, debuting in the company’s newest Boeing 737-800s in mid-2016, are a departure from airlines’ previous efforts to shrink seats. In the past, airlines have decreased the width of seats in order to fit more passengers on flights. Some airlines offer seats as narrow as 16 inches, something that has raised concerns for airline makers such as Airbus. Southwest’s new seats, which will also be incorporated into the company’s Boeing 373 Max aircrafts set to debut in 2017, will measure 17.8 inches across, making them the widest seat of any 737 coach cabin, according to Southwest. Currently operating Southwest aircraft will not be retrofitted with the new seats, the company says. Instead, those planes will keep current seats measuring about 17.1 inches. According to Bloomberg, the next closest airlines in seat width measurements are Alaska Airlines with 17 inches and United with 17.3 inch seats in the economy class of some 737s. 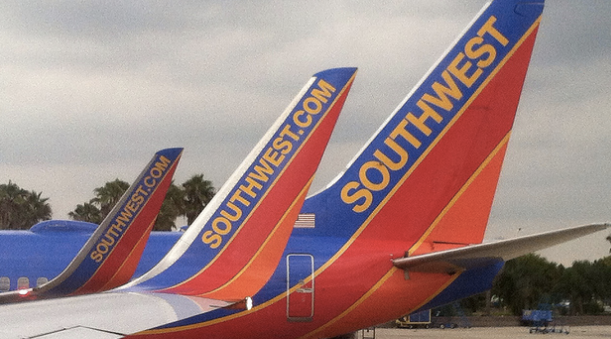 In addition to offering customers more comfort, Southwest estimates it will likely benefit from the seat changes. The new seats are executed to decrease the weight of each aircraft by about 200 pounds, likely leading to reduced fuel consumption. There’s no word on whether or not pricing for tickets on the new aircraft will be affected by the seat width increase.